BRIDGETOWN, Barbados, CMC – West Indies Women’s head coach, Vasbert Drakes, believes the regional side can continue to dominate World cricket for a long time, once the core of the current squad is kept together. 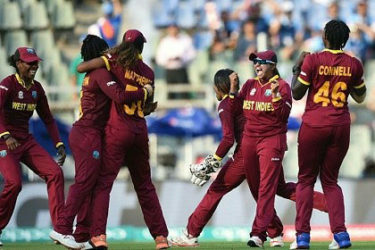 The Windies Women captured their first-ever Twenty20 World Cup when they beat three-time defending champions Australia Women in the final of the tournament in Kolkata last April. “Our high impact players like Stafanie Taylor and Deandra Dottin really made inroads into the opposition and allowed us to control the games for longer periods,” said Drakes, a former West Indies Test player. “It’s exciting for the West Indies because we have some younger players like Hayley Matthews and in five to 10 years’ time, if we can keep that group together, we should be able to dominate for a long period of time. West Indies Women … can dominate for a long time. While it was the side’s first major title, they have been making steady progress in recent years. In fact, they were good enough to make the final of the last 50-overs World Cup in India three years ago when they lost to Australia. Drakes said the foundation for the squad’s current success had been laid by previous coach and former West Indies vice-captain, Sherwin Campbell. “I used to work for the Barbados Cricket Association so I spent some time developing some of the ladies who have represented the West Indies,” Drakes noted. “I inherited a squad from Sherwin Campbell who did some tremendous work with the ladies team over the last five or six years. He laid the foundation and my transition was pretty easy because I had coached those ladies before. “When I took over 12 months ago, our first objective was to win away from home so we could climb up the ICC ranking. We would have played in Sri Lanka and beat them, we played Pakistan and beat them and we went to South Africa before we travelled to India and we had built some really good momentum. The next major tournament for West Indies Women will be next year’s 50-overs World Cup set for England.